Handcrafted from sterling silver, this eye catching Schnauzer charm will be admired by everyone. Intricate and stylish, this unique piece would be a gleaming addition to any Schnauzer jewelry collection. 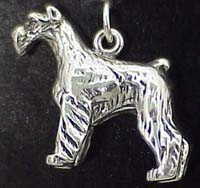 Approximate size on the Schnauzer charm is 5/8 x 5/8 inches. 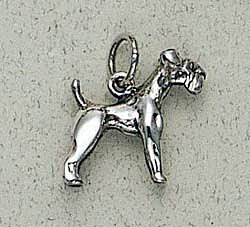 This sterling silver Schnauzer charm is a special piece of handcrafted jewelry. Each Schnauzer charm would be a gleaming addition to any Schnauzer jewelry collection. It makes a nice Schnauzer gift item. Approximate size on the Schnauzer charm is 3/4 inches. The sculpted image of this Miniature Schnauzer, captured in antiqued sterling silver, will win its way into your heart. It measures approximately 13 x 10mm with a 4mm core that is interchangeable as well as compatible with Reflections, Expression, Kera, SilveRadoand other popular 3mm bracelets and necklaces. Small Schnauzer Pin, shown in Grey/Crystal/Jet/Lt Siam with an Antique Silver finish. Keep your faithful friend with you always with this keepsake dog charm bracelet, exclusively from The Bradford Exchange. This solid sterling silver bracelet is beautifully crafted, with gleaming interlocking links and two adorable charms. The first is a fully sculpted solid sterling silver depiction of the dog you love, sparkling with personality front and back! Choose your favorite from a wide selection of breeds: from Dachshund and Yorkie to Pug, Shih Tzu and more. Italian Charms are a great new bracelet sensation over from Italy. They allow you to show the world your individuality and interests by snapping together charms of your choice to create your own Italian charm bracelet. Unlike the old-style "dangling charm bracelets", Italian Charms are flat, rectangular interlocking links, each link with a different design on it. The result is a sleek, stylish bracelet that you yourself can easily change again and again by removing, adding and re-arranging.